(Abbreviated) Part 1. Symposia: A. Information Transfer and Integration. Knowledge discovery and knowledge probability distribution for the EPIOS spectroscopic KB-DSS (J.-E. Dubois). Problems in statistical treatment of materials life data (S. Nishijima, Y. Monma). B. Electronic Structure Theory for Materials Research. 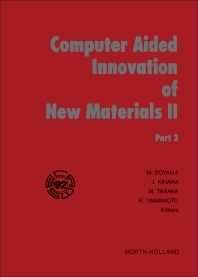 Ab initio simulations on parallel computers (M.C. Payne et al.). Theoretical study of organic magnetisms: Nitronyl nitroxide and related species (M. Okumura et al.). C. Molecular Dynamics and Monte Carlo Simulations. Molecular dynamics simulation of network glasses and algorithms on parallel [SIMD and MIMD] architectures (P. Vashishta et al.). Monte Carlo studies of compositional ordering in binary semiconductors (B. Dünweg, D.P. Landau). D. Lattice Defects and Disordered Materials: Atomistic Modeling and Atom Manipulation. Calculation of the properties of elementary atomic defects in metals (A. Seeger, M. Fähnle). Calculations of positron states in novel superconductors (S. Ishibashi et al.). E. Phase Diagrams. Calculation of phase diagrams for commercial aluminum alloys (L. Kaufman). Three-dimensional thermal calculation of phase change optical disks using internal energy (T. Ishizuka et al.). F. Quantum Chemistry. A quantum chemical reaction design for preparing uniform a-SiC films based on a Ab initio molecular orbital method (K. Sato et al.). Theoretical models for substituted C60 (N. Matsuzawa et al.). G. Molecular Mechanics. Toward a better understanding of covalent bonds (H.D. Thomas et al.). An efficient algorithm for finding low-energy conformations of chain molecules (E. Õsawa et al.). Part 2. H. Chemometrics and Chemical Pattern Recognition. The universal partial least squares, UNIPALS, algorithm for partial least squares, PLS, regression (W.J. Dunn III). Distortion free digital filter for chromatography (K. Yanagi). I. Organic Synthesis Design and Structure Elucidation. Neural network system for the identification of infrared spectra (K. Tanabe, H. Uesaka). Organic synthesis design system CASINO (T. Uchimaru, K. Tanabe). J. Catalytic Science and Engineering. Molecular graphics applied to the investigations of sorbates in zeolites (D.P. Vercauteren et al.). ESYCAD - An expert system for catalyst design (E. Körting, M. Baerns). K. Drug and Molecular Design. Drug design based on artificial intelligence approach (G. Klopman, O.-T. Macina). L. Biomolecular Analysis and Protein Engineering. Advanced computer applications in protein engineering (T. Yao). M. Polymer Materials - Science, Engineering and Design. Molecular dynamics simulation of polymer wettability (G.P. Puglia). N. Alloy Design. Electronic structure theory of alloy phase stability (P.E.A. Turchi, M. Sluiter). O. Composite Materials. Modelling of fibre network deformation during processing of continuous fibre reinforced polymer composites (C. Lekakou et al.). P. Glasses and Ceramics. Reduction of thermal stress in ceramics by shape optimization with CAO (F. Walther, C. Mattheck). Q. Semiconductor Materials, Processes and Devices. Modelling materials for microelectronics - The old and the new challenges (S.T. Pantelides). R. Mechanical Behaviors of Solids and Fluids. Data acquisition, analysis and simulation of micro-indentations (A. Bendeli et al.). S. Process Simulation for Engineering Materials. Numerical modelling of electromagnetic processing (M. Garnier). Author index. Subject index.